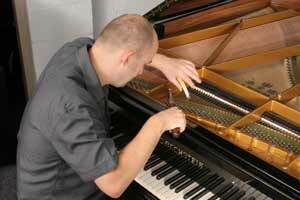 Our expert team of tuners provide an extensive piano tuning service. With decades of experience between them, we can offer you high-quality and accurate tuning for your piano. We can work with any piano regardless of make or model. We recommend that you have your acoustic piano tuned once every six months. Fine piano tuning is different for each piano, as it also involves assessment of the interaction between notes, as well as individual notes. If your piano has not been tuned for some time it may need more extensive attention. For example: if you require pitch raising to bring the piano up to A440 (concert pitch) and some regulation work, it may mean more than one visit/ tuning. Please note, additional work is only carried out after consultation and with agreement from the customer. The cost of a standard tuning is £65.